Boxing champ Floyd Mayweather won $101,250 after betting $25 per hand on a 10-hands-per-play poker machine at a Las Vegas Casino. 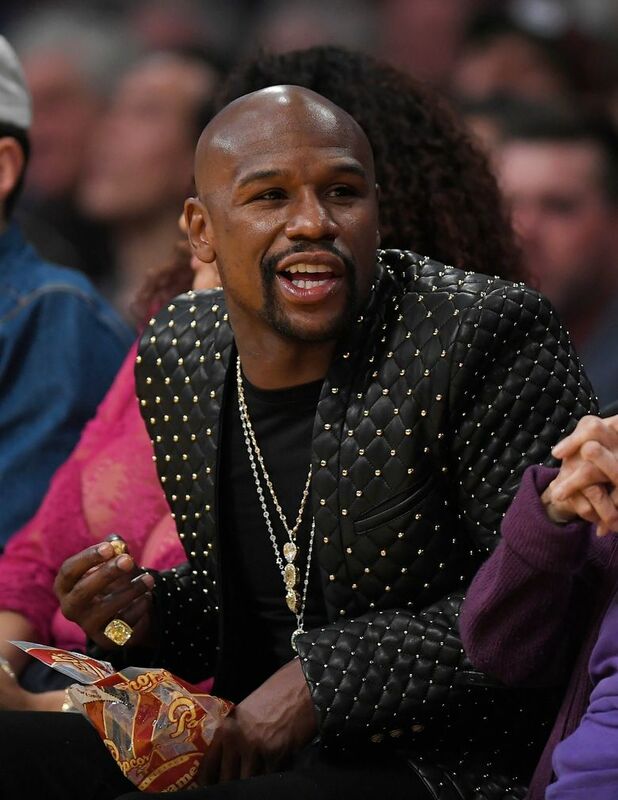 When will poor ol’ Floyd Mayweather ever catch a break? The boxing champ won $101,250 after betting $25 per hand on a 10-hands-per-play poker machine at a Las Vegas Casino, TMZ reported. Considering Mayweather’s earnings have reached $1 billion in his unbeaten career, this is the football equivalent of going for two with a 98-0 lead. Mariners hitters have been hit by pitches more than any team in the American League. Coming soon to the team’s promotional calendar: Kevlar Jersey Night, sponsored by Target. From Virginia Tech’s track-and-field team, ACC hammer-throw champion Emma Thor. Who says high-tech baseball stats are a modern fad? Egghead Jr. — the Widow Hen’s son — had already penciled out the formulas for launch angle, exit velocity and the like while getting some batting tips from Foghorn Leghorn. “Rashun Robinson,” the basketball star at North Dallas’ Hillcrest High School, turned out to be 25-year-old Sidney Bouvier Gilstrap-Portley, whose ruse was foiled when one of the coaches at his original high school spotted him. Alert statisticians immediately changed his stated status from “17-year-old freshman” (what, that wasn’t reason for suspicion already?) to seventh-year senior. The wife of former U.S. Open champ Lucas Glover was arrested for attacking him and his mother after he missed the cut at the Players Championship. So who bailed her out, Elin Nordegren? A man proposed to his girlfriend — named Marlyn — at a Marlins game. The man’s sister, not to be outdone, reportedly has a boyfriend in Denver named Rocky. This year marks the 40th anniversary of Dennis “Bullet Man” Rainear unwittingly running the final 16 miles of a marathon in Grand Rapids, Mich., with a bullet lodged beneath his scalp — apparently the random victim of a stray shot. Here’s guessing he probably isn’t a big fan of the starter’s pistol. The Patriots have hired a martial-arts expert to help their pass-rushers. Or at the very least, fend off chop blocks. Magic co-founder Pat Williams carried a Lil’ Penny doll for good luck at last week’s NBA draft lottery. So what’ll the Lakers rep take next year, Wilt’s little black book? The price tag for the Rams’ new stadium in Inglewood, Calif., has soared past $4 billion, the Sports Business Daily reported. According to a recent survey, the drunkest city in the U.S. is Green Bay, Wis.
Just one little quibble: Packer fans ask that you refer to it as antifreeze, not alcohol. Red Sox reliever Carson Smith landed on the 10-day DL with a shoulder subluxation — from throwing his mitt in an angry fit. The Indians’ Francisco Lindor let players from his prep alma mater, Montverde (Fla.) Academy, take turns shaving off his trademark coiff during an assembly to make good on a promise if the team posted an unbeaten season. What, you’ve never heard of a shortstop in a shave situation before?